Technology for Justice, How Information Technology Can Support Judicial Reform. 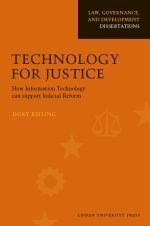 Technology for Justice examines impacts of information technology (IT) on the administration of justice. Court users all over the world complain mainly about long delays, lack of access to justice and court corruption. Drawing on a broad variety of sources - comparative studies, statistics, case law and jurisprudence, studies on IT use and on court usage - this study examines how IT can help to remedy these complaints. The study, contributing to knowledge about information use and IT in proceedings, analyzes how automated case registration systems have revolutionized thinking about case management and significantly reduced court disposition times. It also explores Internet technology’s potential for increasing access to legal information, predicted by Richard Susskind in 1996, as a means for self-help with settlement and support for court access. Providing the first systematic analysis of court corruption, it analyzes IT’s contribution to reducing corruption. It closes by providing insights into the Internet’s new challenges for judiciaries. and was awarded the PhD Degree. As a gift, I asked for a collection to make a donation to Urgent Action Fund-Africa. As promised, here is the report on the donation so far. The total amount collected is € 1960,-. Thank you all! supporting women who were raped in armed conflict and thus contracted HIV-AIDS. This is the report of a conference on the subject. this programme very convincing and worthy of support. Finally, at the end of August 2010, I transferred € 2000 to UAFA. so we could augment the present amount with the tax benefit. However, that turned out to be a nice idea that could not work. Here is press info in English: 150, 250, 425 words. Persinformatie in het Nederlands: 109, 116, 250, 500 woorden. Deel 2 over IT in gerechten is samengevat voor een artikel voor het WODC. Part 2 on court technology was summarized for a WODC-publication. Ook deel 4 en deel 5 komen in een mr-online blog aan de orde. And so are Part 4. and Part 5. 6.1 Technology for Justice: How Does Information Technology Affect Delay, Access and Corruption?